The lending of a calligraphy masterpiece from the Taipei Palace Museum to a Japanese museum has sparked outrage among Chinese netizens. 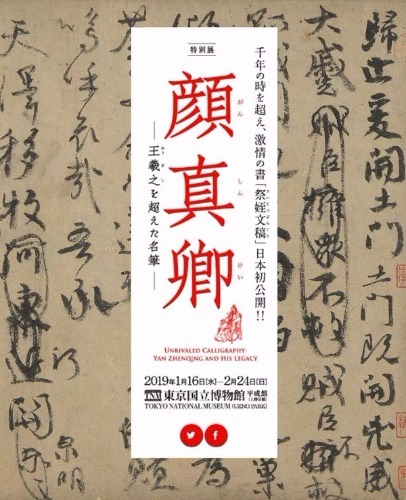 A poster about the exhibition of Ji Zhi Wen Gao in the Tokyo National Museum. Ji Zhi Wen Gao, a funeral ode written by master calligrapher Yan Zhenqing from the Tang Dynasty (618-907) to his nephew, will be displayed at the Tokyo National Museum from Jan 16 as part of a calligraphy-themed exhibition, according to a poster published by the museum. It is the first time the artwork, which was lent from the Taipei Palace Museum in Taiwan, will be displayed in Japan. The loan of the calligraphy work, considered one of most precious cultural relics collected in the Taipei Palace Museum, has sparked heated debate on China's social networking platforms. A topic with the hashtag "Ji Zhi Wen Gao" on Sina Weibo has been viewed 230 million times as of Tuesday afternoon. Many netizens criticized the Taipei Palace Museum for loaning such a precious and delicate treasure to Japan. "The words in the calligraphy are full of deep sorrow for the nation and family, and are a symbol of the unyielding national integrity… Art goes beyond boundaries, but where is the moral backbone of our nation?" said one netizen called "Xiarishanlan_Cassiopeia". Sun Peiyang, a cultural scholar, said in a video clip published by People's Daily that Ji Zhi Wen Gao has a high aesthetic value for its varied calligraphy styles written when the calligrapher was overwhelmed by sorrow for the death of his nephew who died fighting the rebellions, as well as high value as historical literature which recorded the Yan family's patriotic spirit in turbulent times of the nation. He worried that the delicate paper artwork, which is more than 1,000 years old, will be damaged in the display overseas. Sun said: "Traditionally, paper works are believed to have a life of 1,000 years. So there is a risk that damage might be caused during its exhibition and transportation due to changes in environment such as temperature." According to a report by the Global Times, the Tokyo National Museum said visitors could take photos of the calligraphy works without using a flash, but later changed the statement in another interview, saying photographing would be banned to protect the cultural relic. Taiwan media reports show Ji Zhi Wen Gao had not been put on public display in the island for 10 years before it was lent to the Japanese museum. And the artwork is on a list of 70 precious relics of the Taipei Palace Museum which are subject to strict display restrictions because of vulnerability. Some other experts voiced support for the overseas display of Ji Zhi Wen Gao as a way to promote Chinese culture in other countries. Ling Lizhong, the director of calligraphy and painting of the Shanghai Museum, told paper.cn: "The exchange of cultural relics among museums is normal. The exhibition of Chinese ancient calligraphy works this time at the Tokyo National Museum demonstrates their love and respect for Chinese culture." A staff worker from the Taipei Palace Museum said in the video clip published by People's Daily that cultural relics from Japan will be displayed in the Taipei museum as an exchange, but did not reveal details of the exhibition. Taiwan's Palace Museum houses a great number of national treasures of China, which were transported to the island from the Imperial Palace in Beijing in the turbulent years of the 1930s and 1940s. There have been exchanges among museums across the Taiwan Straits in recent years. In 2011, two halves of the Dwelling in the Fuchun Mountains (or Fu Chun Shan Ju Tu), a painting masterpiece from the Yuan Dynasty (1271-1368), reunited at a display at the Taipei Palace Museum after being separated for more than 359 years.